Artist, you create unique artwork. Have you thought using your work to create an exclusive collection of unique accessories? Why create derivative products from your art? Derivatives of art appeal to the public, that more and more looks for original articles. 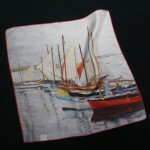 What is more original than a scarf or a hand bag printed of a piece of art from a known artist, produced in small series? Paintings, photographs, drawings, art, sculpture often become beautiful patterns. The latest innovative techniques allow high definition direct to garment printing to get superb reproductions on quality fabrics such as silk or linen. The merchandising of your works at exhibitions and other occasions brings a significant extra income. The marketing of quality derived products does not affect your image, nor the price of your original art. 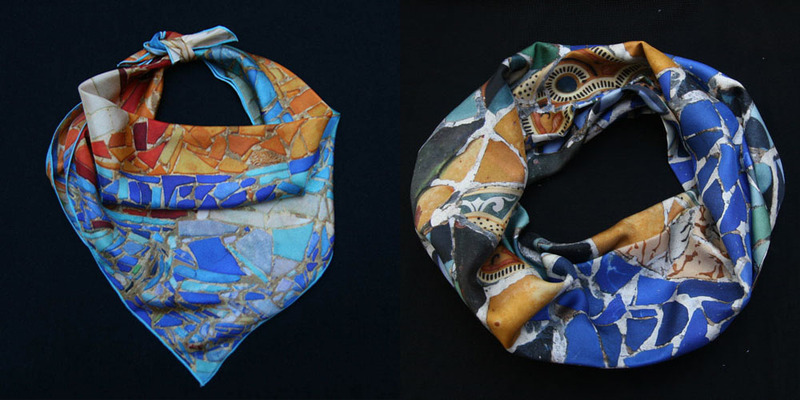 An original remains the original, while a silk scarf or hand bag is easy to wear or to offer as a present to someone or to yourself. 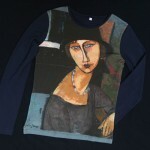 Great artists sell derived products of their artwork. If you feel tempted to create your first collection but the realization seems long and complicated, do not worry: in just a few weeks, you can have your first exclusive collection of high quality accessories, with a small investment on your part and without worries. 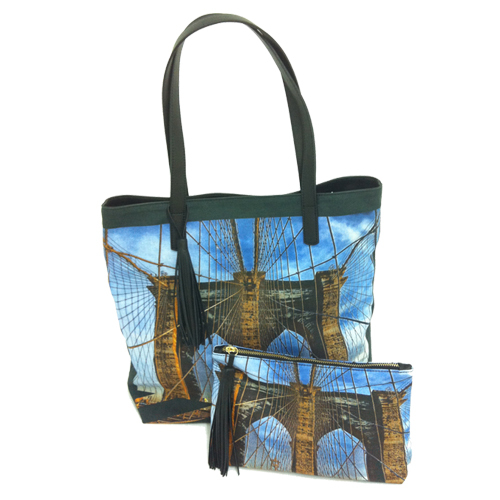 high print quality for accurate reproduction of your artwork, both in terms of color accuracy and fineness of details. 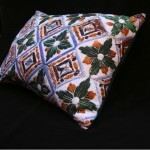 high quality natural fabric like silk or linen. handcrafted with care 100% European. short series and flexibility to combine multiple models to create a real collection. our personalized service at each stage of your project. and obviously absolute respect of your copyrights. 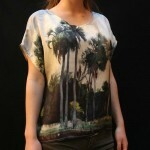 Silk top printed with a painting. Specialized in adapting artwork on textiles, Fibra Creativa offers a selection of quality articles and accompanies you throughout the project. Not all printing systems are equal. To honor your artwork, print quality is crucial. Our prints are high definition and yield excellent reproduction of color and details. Quality shows also in the carefully crafted finishes. Because a beautiful material really makes a difference, we select quality fabrics of natural fibers, like silk, linens and fine cottons. We don’t use polyester or mediocre fabrics. Because each project is unique, we offer a choice of products, formats and materials, as well as the possibility of specific models for the bigger series. Our items are fully printed and manufactured in Europe. We do not import items from Asian sweatshops. Your items are delivered ironed and individually wrapped in a transparent pouch, ready to sell. No need to worry about production. Simply provide us the pictures and we take care of everything else! You wan to test the concept for your firsts collections. Fibra Creativa offers the confection of small collections or short series (from a dozen units for some articles, with the option to vary models), thus a minimum investment. With orders delivered in about 4 weeks, it is easy to restock as needed. When needs grow, the bigger orders will benefit from increasing discounts. We put our experience at work for your project. Whether you have a doubt about the type of article, the fabric or format that best suits your project or want our help to adapt the images of your works, we answer all your questions and support you throughout the project. And obviously, we absolutely respect your copyrights. 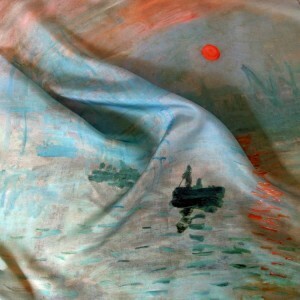 Stylish and fancy, silk scarves are no longer reserved for reproductions of the most famous works of the grand masters, sold in major museum shops. You too can have your own exclusive scarf collection! 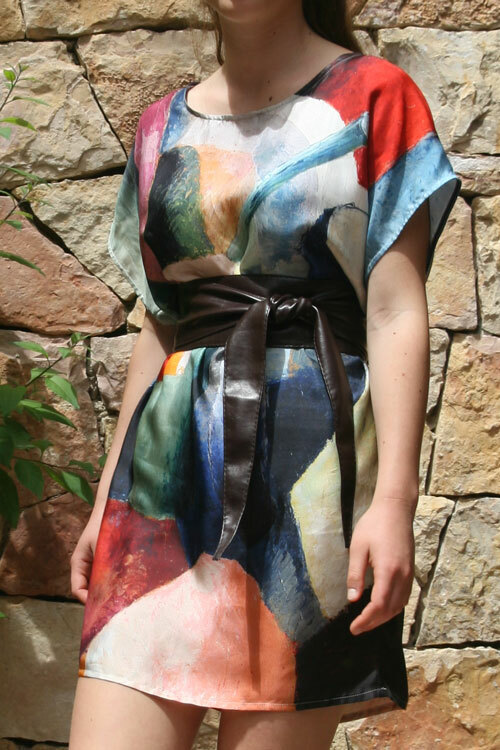 If you want to maximize visual impact of your artwork, print them on silk tops and dresses. These versatile garments display your images in all their splendor. Impressive effect guaranteed! A T-shirt, but not just any T-shirt. Why limit yourself to reproduce your work in a rectangle with a synthetic touch, while you can get real T-shirts printed all-over, on cotton or viscose fabric, as beautiful as comfortable to wear? Linen fabric is elegant and always fashionable, ideal to enhance the value of your artwork. Beautiful and useful, colorful and original handbags are trendy. They are perfect products to showcase your artwork. Our bags are custom printed on linen canvas and made by specialists with leather details and quality finishes. For additional information on these products, visit the product page by clicking on the title of the article or by navigating through the menus on the right or on top of the page.